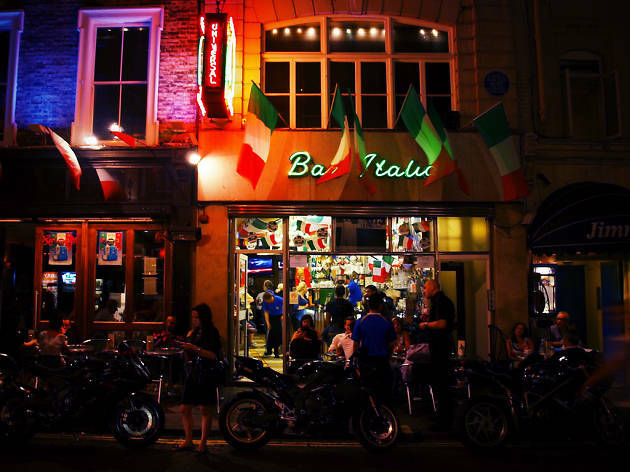 This historic Soho café was established in 1949 by Lou and Caterina Polledri, and quickly became a social hub for the Italian community in London. Despite several upgrades to the decor, much of the original fixtures still remain, from the red and white formica to the Gaggia espresso machine and the flooring. A funny little 24h (I think? It's open late anyhow) eatery and drinkery which you can grab a pizza, a cake or a coffee from any time of day. Great fun at 3am and they usually play cheesy music to keep your spirits high. Better than a budget kebab shop on the way home for sure and the staff are lovely. This italian coffee bar is a Soho institution where you must stop for a coffee! best coffee in Soho! 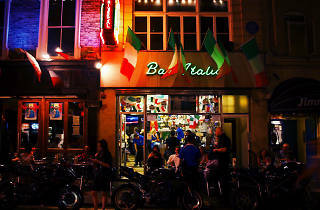 Bar Italia is a true Soho institution. There's few places left like it. Whether you're crawling in there at 3am after a big night out for one of the best coffees in London (or a night cap) or for one of their ridiculously perfect, thin and crispy pizzas to soak up some of the booze, or grabbing a delicious bite to eat for breakfast to bring you back to life after the night before, there is only one place that'll make you feel loved and special. The people watching is also wonderful, all of the world travels through Bar Italia, the rich and famous and the down and out all call it home. It's a just about perfect. A London institution - need I say anymore. The only place for Coffee in the West End, great atmosphere. it's the best coffee you will find in London, it has the nicest and friendliest staff in Soho and the pizza's and escalops sandwiches are to die for! What can I say - it is an institution full stop. They're open almost 24/7, they serve brilliant coffee from their mysterious ancient espresso machine and I love their pizza and panini! The bar opened in 1949 and they haven't decorated since. The service is unfriendly and don’t even try asking for decaf, if you want to make it out alive. These are just some of the reasons why I absolutely love this place! It has character…tons of it! It’s a great place to watch the Soho parade march right past you: tourists, junkies, pensioners, drag queens, business people, families, gay couples, straight couples, dog walkers, prostitutes, policemen and air ambulance staff (Bar Italia seem to be their base…) I could literally spend a whole afternoon people watching from my favourite spot in the window, right next to the door. amazing vibe, fantastic coffee, and a beautiful family. The map location for Bar Italiaissompo.me/D0FAQREA.SomPoint is a method to locate every point in the world using only 8 characters.You can convert every address and point on earth to only 8 characters.